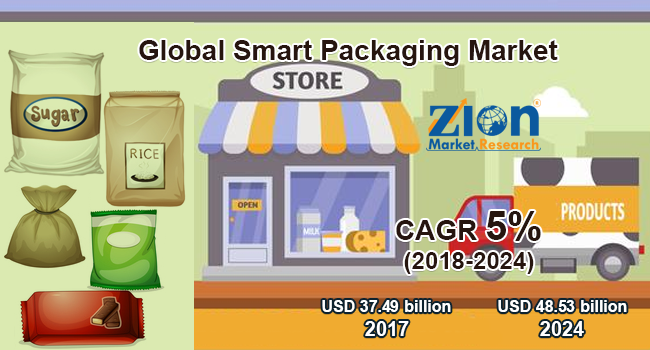 With the presence of a large pool of participants, the global smart packaging market is displaying a highly competitive business landscape, finds a new research report by Zion Market Research (ZMR). E. I. Du Pont De Nemours and Company, Multisorb Technologies Inc., Amcor Limited, BASF SE, RR Donnelley, Sealed Air Corporation, Huhtamaki Group, PakSense Meadwestvaco Corporation, and Stora Enso OYJ are some of the key vendors of smart packaging across the world. These players are focusing aggressively on innovation, as well as on including advanced technologies in their existing products. Over the coming years, they are also expected to take up partnerships and mergers and acquisitions as their key strategy for business development, states the smart packaging market study. Citing an instance, in October 2018, Harpak-ULMA Packaging – a global leader in offering complete packaging solutions for food, personal care, and medical device industries – entered into strategic alliance with Rockwell Automation Inc – a U.S. based supplier of industrial automation and information products – for developing smart as well as connected packaging solutions. As estimated in this report, the global smart packaging market stood at US$ 37.49 billion in 2017. Witnessing a tremendous rise during the period from 2018 to 2024, the revenue in this smart packaging market is expected to reach US$ 48.53 billion by the end of the forecast period. The main types available in this smart packaging market are active packaging, intelligent packaging, and modified atmosphere packaging. Among the three, the demand for active packaging is relatively higher and the trend is anticipated to remain so over the next few years, notes the smart packaging market research report. “Escalating demand for functional and smart packaging along with growing consumer awareness for reducing food wastage is predicted to impel smart packaging market trends,” says the author of this study. Apart from this, rising purchasing capacity along with altering lifestyle of consumer will further contribute towards the growth of smart packaging market in the years ahead. In addition, a plethora of applications in personal care, automotive, food & beverage, and healthcare sectors is likely to chart a profitable growth graph for smart packaging market in the years to come. Absence of integrators, elevated costs, limited product availability, better product designs, high costs of plastic materials, and low level of customer awareness about the use of smart packaging, however, is anticipated to obstruct the growth of smart packaging market in the next few years. Nevertheless, rapid acceptance along with innovations in the printing technology such as 3D printing will open new growth avenues for the business during the estimated timeframe. This, in turn, will nullify the impact of hindrances on the smart packaging market, says the smart packaging market study. Regionally, North America has been leading the worldwide smart packaging market and is anticipated to continue on the dominant position in the years to come, states the smart packaging market study. The rising purchasing power of consumers and increasing health awareness among them is the main factor behind the dominance of the North America smart packaging market. Swift growth of industries such as automotive, food & beverage, manufacturing, pharmaceutical, and logistics along with recovery from economic slowdown in North America is another significant factor that is supporting the growth of this regional smart packaging market. In addition, to fulfill the humungous food demand in the region, imports from other region have increased significantly and it will be the key driver for the smart packaging market in the region.